"Ruby and Sapphire" redirects here. For the Steven Universe characters, see Garnet (character). For the minerals, see Corundum. North American box art for Pokémon Ruby, depicting the legendary Pokémon Groudon. The box art for Pokémon Sapphire Version depicts the legendary Pokémon Kyogre (not pictured). Pokémon Ruby Version[a] and Sapphire Version[b] are role-playing video games developed by Game Freak, published by The Pokémon Company and Nintendo for the Game Boy Advance. They are the first installments in the third generation of the Pokémon video game series, also known as the "advanced generation". For the first time after years of Nintendo publishing the games alone in all regions, The Pokémon Company began co-publishing the games since the establishment of the company by the owners of the franchise. They were first released in Japan in late 2002 and internationally in 2003. Pokémon Emerald, a special edition version, was released two years later in each region. Remakes of the two games, titled Pokémon Omega Ruby and Alpha Sapphire, were released for the Nintendo 3DS worldwide on November 21, 2014, exactly twelve years to the date of the original Ruby and Sapphire release date, with the exception of Europe, where it was released on November 28, 2014. The gameplay is mostly unchanged from the previous games; the player controls the main character from an overhead perspective, and the controls are largely the same as those of previous games. As with previous games, the main objectives are to catch all of the Pokémon in the games and defeat the Elite Four (a group of Pokémon trainers); also like their predecessors, the games' main subplot involves the main character defeating a criminal organization that attempts to take over the region. New features, such as double battles and Pokémon abilities along with 135 new Pokémon, have been added. As the Game Boy Advance is more powerful than its predecessors, four players may be connected at a time instead of the previous limit of two. Additionally, the games can be connected to an e-Reader or other advanced generation Pokémon games. Ruby and Sapphire received mostly positive reviews, though critics were divided in their assessment of the games, especially on the gameplay and graphics. Most of the complaints focused on the fact that the gameplay had not changed much since previous generations, and the connectivity issues revolving around the past generations. With the popularity of Pokémon waning at the time, the games sold less than previous generations. However, they were still critical and commercial successes; with around 16.22 million copies sold according to IGN, they are the best-selling games for the Game Boy Advance. The basic mechanics of Ruby and Sapphire are largely the same as their predecessors'. As with all Pokémon games for hand-held consoles, gameplay is in third-person, overhead perspective and consists of three basic screens: a field map, in which the player navigates the main character; a battle screen; and the menu, in which the player configures their party, items, or gameplay settings. The player begins the game with one Pokémon, and can capture more using Poké Balls. The player can also use their Pokémon to battle other Pokémon. When the player encounters a wild Pokémon or is challenged by a trainer to a battle, the screen switches to a turn-based battle screen where the Pokémon fight. During battle, the player may fight, use an item, switch their active Pokémon, or flee (the last is not an option in battles against trainers). All Pokémon have hit points (HP); when a Pokémon's HP is reduced to zero, it faints and cannot battle until it is revived. If the player's Pokémon defeats the opposing Pokémon (causes it to faint), it receives experience points. After accumulating enough experience points, it may level up; most Pokémon evolve into a new species of Pokémon when they reach a certain level. Apart from battling, capturing Pokémon is the most essential element of Pokémon gameplay. During battle with a wild Pokémon (other trainers' Pokémon cannot be captured), the player may use a Poké Ball on the wild Pokémon. If successful, the Pokémon will be added to the player's active party (or stored if the player already has the maximum six Pokémon in his/her party). Factors in the success rate of capture include the HP (and/or status effects such as Paralysis or Sleep,) of the target Pokémon and the strength of the Poké Ball used: the lower the target's HP and the stronger the Poké Ball, the higher the success rate of capture is. The most prominent change in the battle mechanics is the introduction of double battles, in which the opposing parties each use two Pokémon at the same time. Consequently, certain Pokémon moves can affect multiple combatants at once. Multi battles were added alongside double battles. They are identical to double battle, but there are two trainers to a side, each controlling one of the two Pokémon sent out. Also new to the games are innate abilities and natures; the former is shared by every Pokémon of a certain species, while the latter may vary among a particular species. Abilities grant their holders certain powers in battle, such as immunity against certain types of moves or strengthening a certain type of move. Natures, like innate abilities, affect the strength of Pokémon in battle; however, they affect the stats of the Pokémon rather than directly affecting the strength of the moves. Another stat introduced in Pokémon Ruby and Sapphire is Condition, an important factor in Pokémon Contests, mini-games in which participants perform moves before a judge. Both Pokémon and their moves have a Condition, which is increased by using Pokéblocks (candies made from berries). Ruby and Sapphire were the first games to have different weather conditions (sunny, rain, hail, and sandstorm), and these affected battle in unique ways. Secret bases were added as a one off feature where players could open up a hole in the world and customize the place with various items picked up in game. Players who linked up with others who set up secret bases were able to battle an NPC version of that trainer within their secret base. Like Pokémon Gold, Silver, and Crystal, Ruby and Sapphire keep track of real-life time; this influences events like tides and berry plant growth. However, unlike their predecessors, Ruby and Sapphire do not differentiate between day and night. Also, due to the differences in the technical specifications of Game Boy link cables and Game Boy Advance link cables, Ruby and Sapphire cannot be linked with Pokémon games of previous generations; one cannot battle with or trade to the previous generations. Ruby and Sapphire have limited e-Reader support. Nintendo released Battle-e Cards, a set of e-Reader cards that contained trainer battles in which the player could see previously-hidden Pokémon. A special e-Reader card called the Eon Ticket was also released; obtained through the Mystery Gift function, the Ticket allows the player to reach a place called Southern Island. There, the player faces either Latios or Latias, depending on which version the player is using. Ruby and Sapphire are also able to connect to the GameCube games Pokémon Colosseum, Pokémon XD: Gale of Darkness and Pokémon Box. In the former two, once players reach a certain point in the game, they are able to transfer Pokémon between Colosseum/XD and Ruby/Sapphire. Additionally, those who pre-ordered Colosseum were able to access the Pokémon Jirachi and see a preview of the movie Pokémon: Jirachi Wish Maker. Box, a so-called Pokémon "Microsoft Office", allows players to store and organize their Pokémon on the GameCube. Also, in the European version of Pokémon Channel, players could receive a Jirachi at a certain point in the game, which they could then transfer over to Ruby/Sapphire. Ruby and Sapphire are set in the Hoenn region, designed to be similar to Japan's island of Kyushu. Pokémon Ruby and Sapphire take place in the Hoenn region, located some distance from the Kanto and Johto regions featured in previous games. 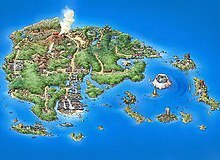 The design of Hoenn was based on the Japanese island and region of Kyushu; however Hoenn is rotated 90° relative to Kyushu, as Junichi Masuda felt that it would provide a better gameplay balance. Like Kyushu, Hoenn possesses many smaller islands, and part of the region is dominated by sea routes, several of which contain areas where the player can dive underwater. Like other Pokémon games, Ruby and Sapphire's gameplay is linear; the main events occur in a fixed order. The protagonist of Pokémon Ruby and Sapphire is a child who has recently moved to a small town called Littleroot Town. At the beginning of the games, the player chooses either Treecko, Torchic, or Mudkip to protect Professor Birch, the regional professor, from an attacking Poochyena. After defending Birch, the player is taken to his lab and receives the chosen Pokémon as his or her starter Pokémon with the choice of Mudkip, Treecko, or Torchic. After that the player encounters May, daughter of Professor Birch. The player's rival, who appears as the professor's child, is also a Pokémon Trainer and occasionally battles the player. The games' two main goals are defeating the eight Gym Leaders, proving oneself worthy of challenging the Elite Four and Champion to become the new Champion and completing the Pokédex by capturing, evolving, and trading to obtain all 202 Pokémon (It is possible to obtain all 386 Pokémon, but this requires trading with Pokémon FireRed and LeafGreen). In addition to the main quest of defeating the Gym Leaders, there are side quests in which the player can aid NPCs by fulfilling tasks, usually by obtaining items. The most prominent subplot involves Team Aqua and Team Magma, crime syndicates who want to use Pokémon to alter the climate of Hoenn: in Ruby, the villains, Team Magma, want to use the legendary Pokémon Groudon to dry up the oceans of Hoenn and increase the region's landmass; in Sapphire, the Team Aqua are the villains and they try to use Groudon's counterpart, Kyogre, to flood the landmasses of Hoenn and increase the region's ocean. Prior to facing the eighth Gym Leader, the player has a showdown with Magma/Aqua where the team's leader uses a mystical orb that awakens the slumbering Pokémon, believing it has the power to enthrall their respective target, only for the Pokémon to become enraged and cause catastrophic, region-wide climate changes—a drought in Ruby, and heavy rainfall in Sapphire—until it is defeated or captured by the player. The player's father also introduces the player to Wally, a sickly young boy whom the player helps capture a Pokémon to be his companion as he moves away from the big city. Wally eventually overcomes his illness and becomes a successful Pokémon trainer, ultimately becoming the final challenger the player must face before the Elite Four. Pokémon Ruby and Sapphire were developed by Game Freak and Nintendo under the direction of Junichi Masuda. As with its predecessors, Ken Sugimori was the art director, although these were the first games in which he did not single-handedly produce all of the art. When asked where his design team came up with the ideas for all of the new Pokémon, Sugimori stated that they got their ideas from past experiences in their childhood involving nature, animals, and the media and then base them on insects. Even looking at the world in a different perspective sometimes provided inspiration for the creatures. "First we select an insect and after that we add essential elements to the insects to make it more like Pokemon, such as adding some hard shape to it, to be more like steel," Sugimori said, describing the process of creating a Pokémon. As the Game Boy Advance was able to handle newer, enhanced graphics, Ruby and Sapphire were the first games in the series that allowed up to four people to share information at one time, as opposed to the previous limit of two. However, the development team used a more basic graphics engine in order to keep the game simple and not overly confusing. The team wanted the games to appeal to a large audience, so the game was designed to be easy enough for younger generations of children to play, but new features were added to bring the veteran gamers back. Masuda stated that the basic philosophy of all Pokémon games is communication; in the Pokémon series, this is manifested in trading and battling with other people. When asked about the new concept of double battles, the developers noted that they tried to focus more on the original one-on-one battles as the main type of competition and only added the double battles as a "new challenge". They stated that if they receive positive feedback about the double battles, the feature may appear more in future generations. The games were the first in the series that did not contain all of the Pokémon from previous generations. Sugimori stated that the team tried to include all the new Pokémon as well as some from previous generations. When asked about any features that could not be included due to technical restrictions, Masuda noted that he wanted each individual Pokémon to make up to three different cries depending on its mood. Nintendo did not promote Ruby and Sapphire at the 2002 E3 convention; however, it launched a USD $7 million promotional campaign that lasted from March to May 2003. In addition to rewarding pre-orders of the games with merchandise, Nintendo held a contest in which participants submitted videos of themselves singing the Pokémon theme song with their own re-written lyrics; the grand prize for that event was a Lugia PT Cruiser. Later that year, Nintendo launched the EON Ticket Summer Tour, in which 125 Toys 'R' Us stores across the United States offered the Eon Ticket e-Card in stores from July 19 to September 1. Nintendo aired two television advertisements, "Faces" and "Names", on prime-time network, cable, and syndication. "Faces" featured Pokémon juxtaposed with human look-alikes; "Names" featured people shouting out the names of Pokémon and emphasized the fact that the games introduced 100 new Pokémon. Additionally, Nintendo collaborated with United Kingdom beverage brand Vimto to promote the games. The audio of Ruby and Sapphire consists entirely of game music; all dialogue is on-screen. The music, composed by Junichi Masuda, Go Ichinose and Morikazu Aoki, is completely instrumental except for two tracks with vocals, "Trick Master" and "Slateport City". The soundtrack of the game was released under the Mediafactory label in Japan on April 26, 2003; the album reached #297 on the Oricon charts and charted for one week. Junichi Masuda wrote only battle tunes, Go Ichinose wrote most of the town, route, fanfare & 'Spotted' tunes, whereas Morikazu Aoki did the remainder. The soundtrack is noted for its heavy use of trumpets. The games met with mostly positive reviews. IGN gave them an "Amazing" 9.5 out of 10 rating and awarded them the Editor's Choice Award; in 2007, the games were collectively named the tenth best Game Boy Advance game of all time in an IGN article. GameZone also gave the games a 9.5 out of 10 rating and gave the games an Outstanding Award. GamePro gave the games 5 out of 5 stars and named them Editor's Choices. ComputerAndVideoGames.com gave the games a 9 of 10, and GameSpot gave the games 8.1 out of 10. Eurogamer and 1UP.com were less enthusiastic about the games, however; Eurogamer gave the games 7 out of 10, and 1UP gave the games a B-. Reviewers were divided in their critiques of the games, especially concerning the gameplay and graphics. IGN praised the "deep design" and noted that the addition of features such as double battles greatly increased the strategic aspect of the games. GamePro also thought that the addition of double battles "add[ed] challenge" and "made the harder battles far more strategic than before—the way the game should be". Likewise, ComputerAndVideoGames.com called the gameplay "incredibly compelling and addictive". GameZone noted that the gameplay was more refined and challenging than that of previous titles. However, GameSpot called the games "a cakewalk from start to finish" and claimed that Ruby and Sapphire "don't offer much of a challenge". Eurogamer also felt that the mechanics "[get] very tired, very fast". 1UP.com also felt that the games were formulaic and that double battles were underused. ComputerAndVideoGames.com was enthusiastic over the graphics, calling them "gorgeous". Other reviewers were less enthusiastic, however. GamePro felt that the graphics were only "a fair bit prettier" than those of the Game Boy color games; GameZone said that the games "still [use] the simple animations and basic character designs that were created for the original, color-less Game Boy". IGN and 1UP.com noted that the graphics had received only a minor upgrade, and Eurogamer felt that the graphics had been upgraded to a "functional level at best". The audio was generally well-received: GameZone and GameSpot both felt the audio was catchy; GameZone gave the audio an 8 out of 10 score, saying that while the music "was annoying at times, [...] it's also very good. [...] I found myself humming the music when I wasn't playing". Other complaints included the removal of the time system of Gold and Silver and the inability to import Pokémon from the games of previous generations. Pokémon Ruby and Sapphire were highly anticipated. In Japan, they sold 1.25 million units within the first four days of release and were the best-selling games of the 2002 holiday season; sales totaled around 4.4 million within six weeks of release. They also became the first games to sell 2 million copies in Japan since 2001's Final Fantasy X and the first games for a hand-held console to do so since 2000's Yu-Gi-Oh! Duel Monsters 4. [c] In North America, Nintendo sold 2.2 million units by April 2003 (within one month of the games' North American release) in the region alone. Ruby and Sapphire were the second and third best-selling games, respectively, of 2003. The games enjoyed success in Europe as well. They were the second best-selling games of the holiday season in 2002; even before release, European retailers imported cartridges from the United States to meet the high demand for the games. With around 16 million units sold worldwide, the games are the best-selling titles ever for the Game Boy Advance. However, analysts noted that with "young kids...gravitating toward Yu-Gi-Oh!" at the time, Pokémon's popularity was waning. This was reflected in the games' sales compared to those of previous generations: Red and Blue sold nearly 27 million units worldwide, and Gold and Silver sold over 23 million units. Pokémon Emerald Version[d] is an enhanced version of Pokémon Ruby and Sapphire, developed by Game Freak, published by The Pokémon Company and Nintendo for the Game Boy Advance. It was released in Japan on September 16, 2004, North America on May 1, 2005, Australia on June 9, 2005, and Europe on October 21, 2005. Although the gameplay is as that of Ruby and Sapphire, Emerald introduces new features. The plot is modified; both Team Magma and Aqua are villains who are locked in a constant gang war and awaken Groudon and Kyogre, respectively. When the two legendary Pokémon begin to battle each other, the protagonist must unleash the legendary Pokémon Rayquaza (pictured on the box cover) to calm them. Some of the game mechanics are changed as well. Though double battles were clearly marked in Ruby and Sapphire, in Emerald, two separate trainers might unite to battle as a pair (fixed in games thereafter). After the Elite Four is defeated, the player may re-battle Gym Leaders in a double battle if they are called on their PokéNav. Also, Pokémon sprites are animated in battle like they were in Pokémon Crystal. Probably the most significant addition is the Battle Frontier, an expanded version of the Battle Tower in Ruby and Sapphire. Another change made in Emerald is the addition of Team Magma's base on the side of Mt. Chimney; moreover, the legendary Pokémon Groudon is found here, rather than in the Seafloor Cavern. Both teams make repeated efforts to alter the landscape. Team Magma attempts to make a volcano erupt, while Team Aqua tries to steal a weather-altering Pokémon. A new character named Scott is also introduced in this game. Unknown to the player, he is the creator of the Battle Frontier. He follows the player throughout the game, watching them battle each Gym Leader and even meeting up with them when they get to the Battle Frontier. Emerald has been generally well received. The game has an aggregate rating of 77% on GameRankings. GameSpot gave it a 7.5 out of 10; IGN gave it an "Impressive" rating of 8.0 out of a possible 10. Eurogamer, however, gave Emerald a score of 6 out of 10. Though it praised Emerald for looking better than either Ruby or Sapphire and for having harder and longer gameplay, it criticized the game for not even being a "half changed update [...] but more of a director's cut". Emerald was the second best-selling game in the United States of 2005; it sold 6.32 million copies, making it the third-best selling game for the Game Boy Advance. In 2011, it was reported that the game was still selling in Japan in 2010 with approximately 7,724 units sold that year. Pokémon Box: Ruby and Sapphire, or simply Pokémon Box, is a spin-off Pokémon game for the GameCube console, bundled with a Nintendo GameCube – Game Boy Advance link cable and a Memory Card 59. It was released in Japan on May 30, 2003 and in North America on July 11, 2004, but only through the New York Pokémon Center and its online store. It is no longer available in either location. The game was released in some parts of Europe as Pokémon Memory Magic due to translation problems, and Europeans only could get the game by using points from Nintendo of Europe's loyalty program, or by buying the Pokémon Colosseum Mega Pack. The game is essentially a storage system for the Game Boy Advance Pokémon games that allows players to trade and store Pokémon that they have caught in Ruby, Sapphire, Emerald, FireRed, and LeafGreen onto a GameCube memory card. Players can then organize and interact with their Pokémon on the GameCube, such as allowing them to breed. Unique Pokémon can also be acquired. Another feature allows the games to be played on the television via the GameCube Game Boy Advance Cable. Options such as taking screenshots of the game are available in this mode. Another addition is the "Showcase", where players can create and display game pieces of Pokémon. Nintendo referred to the game as "the most exclusive Pokémon software ever offered to North American Pokémon fans," but it was generally considered to be unnecessary, receiving a score of 50% on GameRankings from 1 review. Craig Harris of IGN gave the game a "Meh" rating of 5.0 out of 10, praising the interface, which makes the organization of Pokémon much easier as compared to the Game Boy Advance interface, as well as the emulator which allows Ruby and Sapphire to be played on the GameCube. He also stated that the game was a good deal due to the inclusion of a Memory Card and Cable. However, Harris cited the "Showcase" as "entirely unnecessary and completely out of place," and said that overall the game lacked much to do. He wrote, "It's targeted specifically for the truly die-hard Pokemon fan, but it requires so many specific elements to actually be useful to anyone." Allgame gave the game three and a half out of five stars. ^ a b c d "Pokemon Ruby Version for Game Boy". GameSpot. Retrieved June 22, 2009. ^ a b "Pokémon Omega Ruby and Pokémon Alpha Sapphire". May 7, 2014. Retrieved May 7, 2014. ^ Harris, Golin. "Pokémon X and Pokémon Y Sell More Than 4 Million Units Worldwide in First Two Days". Business Wire. Retrieved January 25, 2019. ^ Harris, Craig (March 17, 2003). "Pokemon: Ruby Version". IGN. News Corporation. Retrieved August 2, 2008. ^ Twang, Kuyani (May 8, 2014). "Pokemon Omega Ruby and Alpha Sapphire speculation bingo". Yahoo News Network. Retrieved May 8, 2014. ^ Pokémon Sapphire Version instruction booklet, p. 50. ^ Harris, Craig (September 12, 2003). "Pokemon Battle-e Cards". IGN. News Corporation. Retrieved August 3, 2008. ^ a b "The Pokémon Ruby & Sapphire "EON Ticket" Summer Tour is coming to Toys 'R Us!". Pokemon-games.com. Nintendo. Archived from the original on August 19, 2007. Retrieved July 18, 2008. ^ "Pokemon Colosseum Linkup Revealed". IGN. News Corporation. October 15, 2003. Retrieved July 17, 2008. ^ Harris, Craig (July 3, 2004). "Pokemon Box: Ruby & Sapphire". IGN. News Corporation. Retrieved July 17, 2008. ^ "Hidden Power of Masuda". GameFreak. September 9, 2004. Retrieved August 2, 2008. ^ "Walkthrough: Badge #1". IGN. News Corporation. Archived from the original on July 9, 2008. Retrieved August 2, 2008. ^ "Guides: Pokemon Ruby/Sapphire Guide (GBA) Walkthrough: Pokemon League Championship". IGN. News Corporation. Retrieved August 2, 2008. ^ "Walkthrough: Badge #2". IGN. News Corporation. Archived from the original on July 6, 2008. Retrieved August 2, 2008. ^ "Pokemon Ruby Version Info". GameFAQs. Retrieved July 18, 2008. ^ a b c d Masuda, Junichi; Morimoto, Shigeki; Sugimori, Ken (May 30, 2003). "Nintendo Interviews: Game Freak on Pokemon!". Computer and Video Games (Interview). Interviewed by Stuart Bishop. Future plc. Archived from the original on February 11, 2007. Retrieved July 18, 2008. ^ "Preview: Pokemon: Ruby and Sapphire Versions". Gamepro. IDG Entertainment. July 15, 2002. Archived from the original on April 14, 2009. Retrieved November 30, 2008. ^ a b Elkin, Tobi (March 2003). "Pokemon grows up with its demographic; Nintendo puts $7 mil behind latest versions". Advertising Age, Bnet. Archived from the original on January 12, 2009. Retrieved July 17, 2008. ^ Harris, Craig (March 12, 2003). "Pokemon Hit the Road". IGN. News Corporation. Archived from the original on January 17, 2008. Retrieved July 18, 2008. ^ Harris, Craig (February 11, 2003). "Pokemon Pre-Sell Goodies". IGN. News Corporation. Retrieved July 18, 2008. ^ Harris, Craig (August 29, 2003). "Nintendo Celebrates Pokemoniversary". IGN. News Corporation. Retrieved July 18, 2008. ^ "Nintendo teams up with Vimto for new Pokemon games". Brand Republic. Haymarket Group. June 24, 2003. Retrieved December 2, 2008. ^ "Pokemon Ruby & Sapphire Super Complete Music" (in Japanese). Oricon. Retrieved November 26, 2008. ^ "The Internet Reacts To The New Pokémon Remakes". Kotaku. May 8, 2014. ^ "Pokemon Ruby Version Reviews". GameRankings. CBS Interactive. Retrieved August 2, 2008. ^ "Pokemon Sapphire Version Reviews". GameRankings. CBS Interactive. Retrieved August 2, 2008. ^ "Pokemon Sapphire Reviews". Metacritic. CBS Interactive. Archived from the original on May 4, 2008. Retrieved July 17, 2008. ^ "Pokemon Ruby Reviews". Metacritic. CBS Interactive. Archived from the original on May 4, 2008. Retrieved July 17, 2008. ^ a b c d "Pokemon Ruby and Sapphire Review". 1UP.com. Ziff Davis Media. January 1, 2000. Archived from the original on August 17, 2011. Retrieved November 26, 2008. ^ a b c d Sutton, Maura (May 8, 2003). "Review: Pokémon Ruby & Sapphire". ComputerAndVideoGames.com. Future Publishing. Retrieved November 13, 2008. ^ a b c d Taylor, Martin (September 8, 2003). "Pokemon Ruby & Sapphire Review". Eurogamer. Retrieved November 13, 2008. ^ ゲームボーイアドバンス - ポケットモンスター ルビー・サファイア. Weekly Famitsu. No.915 Pt.2. Pg.120. June 30, 2006. ^ a b Kasavin, Greg (March 18, 2003). "Pokemon Ruby Version". GameSpot. CBS Interactive. Retrieved July 17, 2008. ^ a b c d Bedigian, Louis (March 24, 2008). "Pokemon Ruby Review". GameZone. Gamezone Online. Archived from the original on November 4, 2008. Retrieved November 13, 2008. ^ "IGN: Pokemon Ruby Version". IGN. News Corporation. Retrieved October 13, 2008. ^ Harris, Craig (March 16, 2007). "Top 25 Game Boy Advance Games of All Time". IGN. News Corporation. Retrieved March 18, 2007. ^ a b c "Review: Pokemon: Ruby and Sapphire Versions". GamePro. IDG Entertainment. March 17, 2003. Archived from the original on July 17, 2008. Retrieved July 17, 2008. ^ a b Harris, Craig (March 17, 2003). "IGN: Pokemon Ruby Version Review". IGN. News Corporation. p. 3. Retrieved November 26, 2008. ^ "Japan Catches A Light Case of Pokemania". Gamepro. IDG Entertainment. December 21, 2002. Archived from the original on April 14, 2009. Retrieved December 2, 2008. ^ "America Braces for Next Huge Pokemon Wave; Pokemon Ruby, Pokemon Sapphire for Game Boy Advance Give New Game-Play and Learning Experience". AccessMyLibrary (Press release). Business Wire. March 17, 2003. Archived from the original on July 16, 2012. Retrieved November 30, 2008. ^ "EU Wraps Up Microsoft Inquiry". Wired. Condé Nast Publications. Associated Press and Reuters. December 19, 2002. Retrieved November 30, 2008. ^ a b "Nintendo Makes Money". IGN. News Corporation. April 4, 2003. Retrieved July 17, 2008. ^ "Top 30 Japanese Video Games 12/08/02". Gamepro. IDG Entertainment. December 18, 2002. Archived from the original on April 14, 2009. Retrieved November 30, 2008. ^ "2003's top video games". AccessMyLibrary. The Charlotte Observer. Knight-Ridder/Tribune. March 9, 2004. Archived from the original on January 12, 2009. Retrieved November 30, 2008. ^ "Game Boy Advance shipments hit 10 million in Europe". Gamepro. IDG Entertainment. December 9, 2003. Archived from the original on April 14, 2009. Retrieved November 30, 2008. ^ "Importers warned over GBA Pokemon titles". The Register. Situation Publishing Ltd. April 28, 2003. Retrieved November 30, 2008. ^ Rose, Mike (October 15, 2013). "Pokemon X & Y sell 4M copies in first weekend". Gamasutra. Think Services. Retrieved October 16, 2013. ^ Chronis, George T. (February 24, 2003). "Pokemon pundits see luster fading: new games seen a solid, no record breakers". AccessMyLibrary. Video Business. Archived from the original on January 12, 2009. Retrieved November 30, 2008. ^ Safier, Joshua; Nakaya, Sumie (February 7, 2000). "Pokemania: Secrets Behind the International Phenomenon" (PDF). Columbia Business School. Retrieved August 5, 2011. ^ "Japan Platinum Chart Games". The Magic Box. Retrieved July 5, 2008. ^ "US Platinum Chart Games". The Magic Box. Retrieved July 5, 2008. ^ "Pokemon Emerald Info". GameFAQs. CBS Interactive. Retrieved August 2, 2008. ^ a b "IGN: Pokémon Emerald Version". IGN. News Corporation. Retrieved September 9, 2007. ^ "IGN: Reader Reviews For: Pokémon Emerald Version". IGN. News Corporation. Archived from the original on July 13, 2011. Retrieved September 9, 2007. ^ "Pokémon Emerald Reader Reviews at Game Rankings". GameRankings. CBS Interactive. Retrieved September 9, 2007. ^ "Pokémon Emerald Reviews at Game Rankings". GameRankings. CBS Interactive. Retrieved September 9, 2007. ^ "Gamespot Summary of Pokémon Emerald". GameSpot. CBS Interactive. Retrieved September 9, 2007. ^ "Review - Pokémon Emerald // GBA /// Eurogamer". Eurogamer. Retrieved September 9, 2007. ^ "AOL Games: Pokémon Emerald". AOL Games. AOL. August 3, 2005. Archived from the original on April 18, 2006. Retrieved March 24, 2006. ^ "Yes, People Still Buy This Game Boy Advance Game". Kotaku. April 25, 2011. ^ a b Harris, Craig (July 20, 2004). "IGN: Pokemon Box: Ruby and Sapphire Preview". IGN. News Corporation. Retrieved September 28, 2008. ^ "Pokemon Box: Ruby and Sapphire Release Information for GameCube". GameFAQs. CBS Interactive. Retrieved September 28, 2008. ^ Tim (September 28, 2008). "N-Europe: News: Pokémon Name Change". N-Europe. Archived from the original on August 17, 2011. Retrieved February 15, 2009. ^ Boyd, Ashley (May 15, 2004). "N-Europe: News: Pokémon Box Gets Starring Role". N-Europe. Archived from the original on August 17, 2011. Retrieved September 28, 2008. ^ "Pokémon Box Ruby and Sapphire Impressions". GameSpot. CBS Interactive. July 10, 2003. Retrieved September 28, 2008. ^ a b Harris, Craig (July 23, 2004). "IGN: Pokemon Box: Ruby and Sapphire Review". IGN. News Corporation. Retrieved September 28, 2008. ^ a b Marriott, Scott Alan. "Pokémon Box > Overview". Allgame. Macrovision Corporation. Retrieved September 28, 2008. ^ "Pokemon Box: Ruby and Sapphire Reviews". GameRankings. CBS Interactive. Retrieved September 28, 2008. ^ "Pokémon Omega Ruby and Pokémon Alpha Sapphire". Nintendo. Retrieved May 7, 2014. ^ Watts, Steve (May 7, 2014). "Pokemon: Omega Ruby and Alpha Sapphire announced". Shacknews LTD. Retrieved May 7, 2014. Game Freak (March 19, 2003). Pokémon Ruby. Nintendo. Game Freak (March 19, 2003). Pokémon Sapphire. Nintendo. Pokémon Sapphire Version instruction booklet. Nintendo. 2003. Hollinger, Elizabeth M. (2003). Pokémon Ruby Version [and] Sapphire Version: Prima's Official Strategy Guide. USA: Prima Games. ISBN 0-7615-4256-6. This page was last edited on 18 April 2019, at 06:00 (UTC).